by Chris Woodford. Last updated: October 3, 2018. Everyone loves a rainbow and most people understand, at least roughly, how they work: raindrops split a beam of white sunlight into rays of colored light, bending the blueish ones more than the reddish ones to make the well-known arc in the sky. Rain, then, is a brilliant method for separating sunlight. Chemists and physicists use a similar method for separating mixtures of substances into their components, turning them into beams of particles and then bending them with electricity and magnetism to make a kind of spectrum of different atoms that are easier to identify. This technique is called mass spectrometry and it was pioneered by British physicist Francis Aston in 1919. Let's take a closer look at how it works! 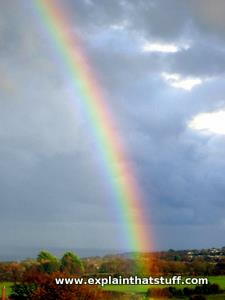 Photo: Rainbows bend short wavelength blue light more than long-wavelength red light. Mass spectrometers work in a very similar way. Mass spectrometers are much simpler than they look—or sound. Suppose someone gives you a bucketful of atoms of different chemical elements and asks you what's inside. You need to separate out the atoms quickly and efficiently, but how do you do it? Simple! Tip your bucket into a mass spectrometer. It turns the atoms into ions (electrically charged atoms with either too few or too many electrons). Then it separates the ions by passing them first through an electric field, then through a magnetic field, so they fan out into a spectrum. A computerized detector tallies the ions in different parts of the spectrum and you can use this information to figure out what kinds of atoms were originally in your bucket. That's the basic idea, anyway. In reality, it's a bit more complex than this—there's no bucket, for a start! Photo: A scientist uses a mass spectrometer in the Aeronomy Laboratory, Air Force Geophysics Laboratory (AFGL). Photo by William W. Magel courtesy of US Air Force. There are numerous different kinds of mass spectrometers, all working in slightly different ways, but the basic process involves broadly the same stages. You place the substance you want to study in a vacuum chamber inside the machine. The substance is bombarded with a beam of electrons so the atoms or molecules it contains are turned into ions. This process is called ionization. The ion beam shoots into a magnetic field (the invisible, magnetically active region between the poles of a magnet). When moving particles with an electric charge enter a magnetic field, they bend into an arc, with lighter particles (and more positively charged ones) bending more than heavier ones (and more negatively charged ones). The ions split into a spectrum, with each different type of ion bent a different amount according to its mass and its electrical charge. A computerized, electrical detector records a spectrum pattern showing how many ions arrive for each mass/charge. This can be used to identify the atoms or molecules in the original sample. In early spectrometers, photographic detectors were used instead, producing a chart of peaked lines called a mass spectrograph. 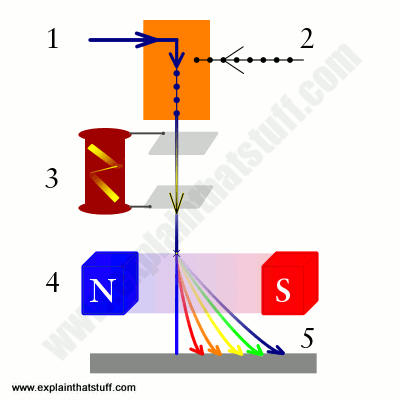 In modern spectrometers, you slowly vary the magnetic field so each separate ion beam hits the detector in turn. Artwork: Mass spectrometer designed by Robert Langmuir. Diagram courtesy of US Patent and Trademark Office. A sample of gas (blue) flows into the vacuum chamber (inner orange circle). The sample is bombarded with electrons to make ions. The ions are accelerated downward in an electric field (toward the curved electric plate labelled 3). A magnetic field created by the electromagnet (outer red circle) bends the ions round in a semicircle (yellow). The ions separate out and are picked up by the electronic detector apparatus (green). You can read more about this in the full patent description, (also listed in the references at the end). What is mass spectrometry used for? Now why would you want to go separating a beam of atoms into a rainbow? Like chromatography, with which it's often paired, mass spectrometry is an important method for identifying the atoms or molecules in complex chemical substances. The inventor of the spectrometer, Francis Aston (1887–1945), used his machine to prove the existence of many naturally occurring isotopes (atoms of the same element with different numbers of neutrons and different mass). Apart from this kind of pure scientific research, there are all sorts of everyday fields in which mass spectrometers are indispensable tools, from crime scene investigation to archaeology and from environmental science to drug design. 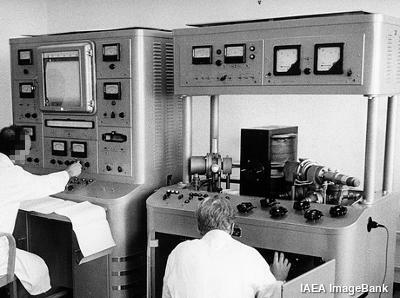 Photo: A mass spectrometer being used to find the nitrogen content of plants fed with fertilizer, photographed at the International Atomic Energy Agency (IAEA) in 1963. Photo by courtesy of International Atomic Energy Agency (IAEA), published on Flickr under a Creative Commons (CC BY-SA 2.0) licence. Mass spectrometers are an obvious way of investigating situations where strange chemicals suddenly appear—and figuring out exactly what those things are. Materials scientists use them to identify the precise chemical composition of samples, which can help to explain why buildings or bridges collapse unexpectedly or why engineering components have suddenly failed. Forensic science relies on being able to identify unusual substances found at a crime scene and match them precisely with similar substances found elsewhere. So, for example, if traces of explosive can be found at an airplane crash site, investigators can probably rule out mechanical failure. If detectives can go further, and trace the explosive's unique chemical signature to a particular place or person, with the help of mass spectrometry, that powerful evidence could lead to a successful criminal conviction. Security is a very closely related application, but works in a more pro-active way (aiming to prevent attacks altogether). Mass spectrometers are increasingly being used for things like baggage scanning and checking traces of chemicals found in suspicious mail packages, to identify what are termed CBRNE (chemical, biological, radiological, nuclear, and explosive) threats. And this sort of application is bound to become more important in future. 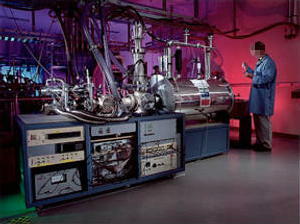 Photo: A Fourier-transform ion cyclotron resonance (FTICR) mass spectrometer at Pacific Northwest National Laboratory. This highly accurate machine is used for molecular biology and genetics research. Photo by courtesy of US Department of Energy. More optimistically, mass spectrometers can help us design new things that make the world a better place. In biotechnology, mass spectrometers are used for studying how proteins work and for identifying viruses and bacteria much more quickly than traditional culture-based methods allow. US chemist John B. Fenn (1917–2010) won the 2002 Nobel Prize in Chemistry for jointly developing an improved form of mass spectrometry called electrospray ionization, which is used for studying macromolecules (very large and complex molecules) such as proteins. Unlike normal mass spectrometry, this technique involves turning a sample into an aerosol burst of droplets, separating it into individual protein molecules, which can then be analyzed with a mass spectrometer in the usual way. Widely used in the pharmaceutical industry, mass spectrometers can help chemists design new drugs much more quickly; among other things, they're useful for figuring out how to maintain the level of a chemical in the body for a certain period of time (which is the key to designing drugs that work effectively). Agricultural scientists who breed and genetically engineer plants use mass spectrometers to measure and maintain levels of desirable chemicals in new crops, or to study how quickly things like fertilizers (which have been radioactively labeled) are taken up from the soil. Mass spectrometers can also help us to understand our environment. We can use them to measure how quickly air and water pollution travels or to discover how fast things like pesticides break down when they're released into soil. Geologists use them to analyze rock samples for valuable minerals and to find out the precise chemical composition of oil and gas deposits. Archaeologists—human history detectives—also use mass spectrometers on soil samples, but with the aim of identifying the plant, animal, and mineral materials used in certain places hundreds or thousands of years ago. So there's much more to a rainbow—at least a rainbow of atoms—than you might think! Mass Spectrometry: A Textbook by Jürgen Gross. Springer, 2017. A fully illustrated reference covering the chemistry and theory of mass spectrometry more than the applications. Mass Spectrometry Handbook by Mike Lee (editor). Wiley, 2012. This 1000-page academic reference has sections covering the use of mass spectrometry in biotechnology, pharmaceuticals, space research, forensics, security, archaeology, geology, and other common applications. Mass Spectrometry: Principles and Applications (Third Edition) by Edmond de Hoffmann and Vincent Stroobant. Wiley, 2013. Aimed at a similar (undergraduate) audience to the one above, this book has exercises and covers applications. Handheld Mass-Spectrometry Pen Identifies Cancer in Seconds During Surgery by Emily Waltz. IEEE Spectrum, September 6, 2017. A new, handheld mass spectrometry detector offers a much faster test for cancer. Mass Spectrometry Gets a New Power Source and a New Life by Dexter Johnson. IEEE Spectrum, February 27, 2017. New power supplies called triboelectric nanogenerators (TENGs) could make mass spectrometers more compact, cheaper, and more portable. Chemical Attack Evidence Lasts Years, Experts Say by William J. Broad. The New York Times, August 27, 2013. Mass spectrometry is helping to bring war criminals to justice years after their atrocities were committed. A Scale for Weighing Single Molecules by Douglas McCormick, IEEE Spectrum, September 7, 2012 California Institute of Technology researchers have developed a nanotechnology mass spectrometer for weighing individual molecules. Fingerprint breakthrough offers new forensic evidence: BBC News, 5 August 2011. How mass spectrometry can be used to probe fingerprints in greater detail than ever before. Machine 'sniffs out skin cancer': BBC News, 21 August 2008. An example of how mass spectrometry has been used in medical research. Mobile 'crime scene lab' developed: BBC News, 22 October 2004. How forensic scientists developed a mobile mass spectrometer for use at crime scenes. Can technology stop terror in the air? by Steven Ashley, Popular Science, November 1985. This old but excellent article from Pop Sci explores the various technologies that were being developed to stop terrorist attacks on airplanes back in the 1980s, including X ray machines and mass spectrometers. US Patent #7,053, 367: Mass Spectrometer by Tomoyuki Tobita et al, Hitachi High-Technologies Corporation, May 30, 2006. 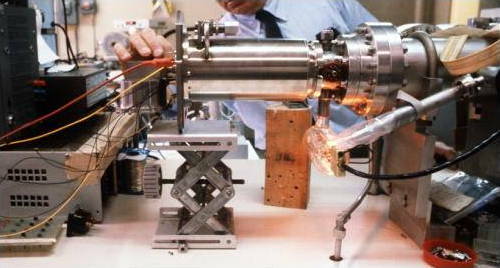 A typical modern mass spectrometer. 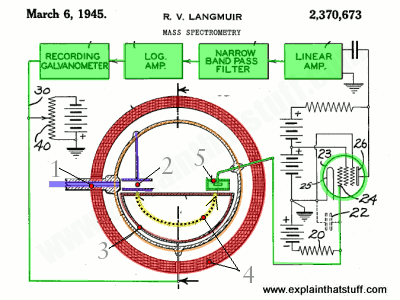 US Patent #2,370, 673: Mass Spectrometry by Robert Langmuir, Consolidated Engineering Corporation, March 6, 1945. The earliest mass spectrometer patent I've found. Dr Langmuir went on to work for General Electric's Research Laboratories before joining Caltech's Electrical Engineering department.